When you are looking for a conservatory that you can use all year round, a tiled roof conservatory could be the ideal solution for your Margate or Kent home. Offering all the benefits of a traditional extension, tiled roof conservatories are the latest innovation in the conservatory industry. Our beautiful tiled roof conservatories enable you to achieve true flexibility in your conservatory design, and to seamlessly combine solid and glazed roofing. Available as both a new conservatory or a conservatory refurbishment, we can tailor for all needs. A tiled roof conservatory gives you all the benefits of extending your living space while improving thermal performance. Whether you are installing a new conservatory, or replacing an old existing conservatory roof a bespoke tiled roof can extend your design choices providing you with the ability to create stylish and thermally efficient rooms without the complicated and time consuming issues that come as part of a traditional extension. We are proud to be able to offer both the LivinROOF system and the RealROOF system from Ultraframe, giving you an increased choice when looking at installing a tiled roof conservatory. Although similar in function and performance, each system has its own unique benefits. Our designer will work with you to ensure that your tiled roof conservatory is completed with the system that is the very best option for you and your home. Our tiled roof conservatories are constructed using insulated composite external panels and slab insulation. These innovative products provide a robust and extremely thermally efficient roof to enhance your conservatory. Your home will retain heat more successfully, which will, in turn, lower your energy bills as you will use your central heating less often. The structure of the roof utilises Ultraframe’s roof system to provide underlying strength and rigidity, ensuring it can withstand the harshest of weather conditions. Your tiled roof conservatory will still allow you plenty of light, as the solid sections can be combined with energy efficient glazed panels, giving you the best of both worlds. Internally, you are treated to a stunning vaulted ceiling which is enhanced by an internal pelmet around the perimeter where lights can be installed. At the highest point of the ceiling, you have the option to insert or hang lights – an unusual feature for a vaulted ceiling. If you prefer a cosier atmosphere, you can choose to have a suspended ceiling, which also allows you to continue the ceiling height from an adjoining room. Whichever roof system from Ultraframe you choose, they will both offer unrivalled versatility. Any conservatory shape can be accommodated with these tiled roofs, meaning that you can still have whichever style of conservatory you desire, without any compromise. 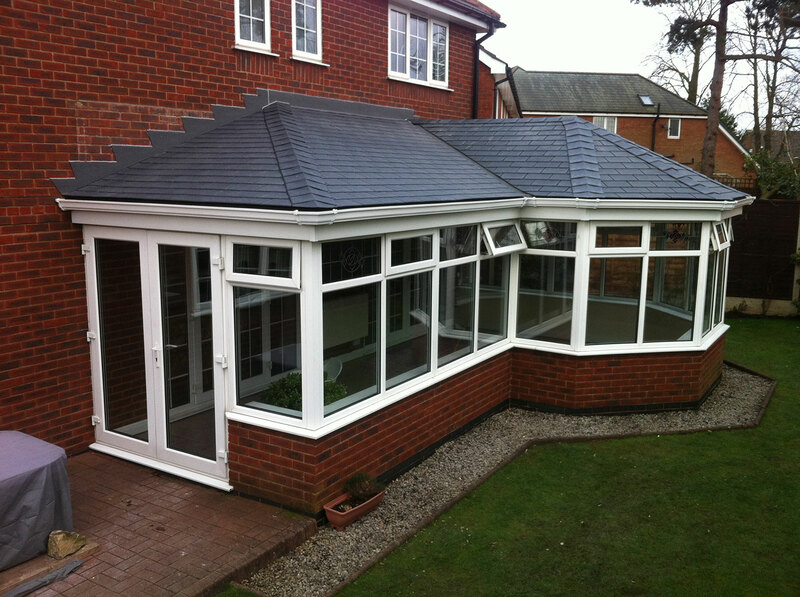 As with all our conservatories, the tiled roof conservatory is designed to meet your exact requirements. Our designer will discuss your ideas and options, then create a tailored design that takes into account all of your preferences. Contact our friendly and helpful team to find out more about these innovative tiled roof conservatories.